So begins the first installment of My Autobiography by S. S. McClure, which ran in McClure's Magazine from October 1913 through May 1914. At the request of the magazine's new editors, who had ousted McClure in 1911 in an attempt to save the bankrupt periodical, McClure agreed to publish his autobiography in McClure's and relinquish any money earned through its publication as repayment on the magazine's debts. Ironically, however, this self-proclaimed self-made man ultimately relied on the talents and work of another in the writing of his life story, the most lasting representation of himself. Though McClure had frequently edited others' writing during his tenure at the magazine, he never imagined himself a writer and instead recruited the help of former McClure's editor Willa Cather. McClure's initial statement of gratitude, however, does not fully disclose Cather's essential role in the work; more than offering mere assistance, Cather authored the entirety of the autobiography, ostensibly recording, after-the-fact, the story as McClure told it. Neither McClure nor Cather ever denied that Cather was the true author of My Autobiography, and McClure recognized her in an inscription in her own personal copy of the 1914 book publication: "With affectionate regard for the real author." Yet for many years, the work remained outside the field of Cather studies, and Cather as the text's author seemed to hold little significance. In the past decade, however, the autobiography has emerged as a location for Cather scholarship, and this digital edition of the original periodical publication is the first republication of the original text. Since 1914, the standard text of the Autobiography has been the book publication which followed the serialization and included both subtle and substantial changes. Among these alterations are fewer photographs, the exclusion of all drawings, the incorporation of readers' letters into the body of the piece, and some slight textual editing. Since there is no evidence that Cather made these changes, returning to the McClure's original allows us to explore, with substantially less corruption, Cather's original text. 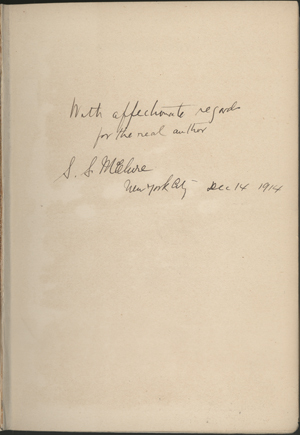 Handwritten dedication from S.S. McClure to Cather in her personal copy of My Autobiograhy, reading "With affectionate regard for the real author S. S. McClure New York City — Dec 14 1914." Image courtesy Archives and Special Collections, University of Nebraska-Lincoln Libraries.